Barbara Brenner was a hell-raiser of the first order. As Breast Cancer Action’s executive director for 15 years, she was a powerful advocate for women living with and at risk of breast cancer. Her wit, clarity, and courage put BCAction on the map as a radical women’s health activist organization. Before Barbara’s diagnosis and untimely death from ALS in 2013, her retirement plan was to write a book about her experiences as a health activist and gadfly of the breast cancer industry. So Much to Be Done is a powerful collection of Barbara’s writings edited by Barbara Sjoholm. This event is co-sponsored by Breast Cancer Action and the University of Minnesota Press. 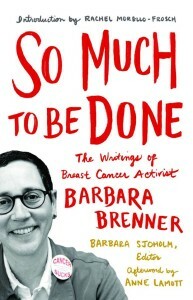 Whether you knew Barbara during her tenure at BCAction or not, this book is chock full of insights about feminism, health activism, and living and dying on one’s own terms. BCAction members across the country are planning to host book events at their local bookstores or in their homes. Check out the calendar, and get in touch if you’d like to organize a book event near you. The world lost Barbara too soon and we are grateful that her visionary writings are being published for all of us to learn from – and continue her legacy of activism. P.S. You can preorder So Much to be Done by clicking here.